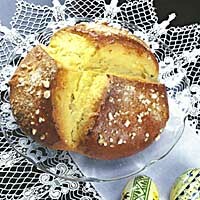 Pinca is a traditional Dalmatian Easter Bread which is given to guests as a symbol of good wishes. 200g sugar plus 1 tbsp. Crumble yeast into small pieces. Mix it with 100g (a little bit heated) flour, the 1 tbsp. sugar and 100ml lukewarm water in a large bowl. Cover it with a towel and leave to rise in a warm place. Heat remaining flour. Add butter and make fine crumbles. Make a hole in center and add sugar, egg yolks, orange zest, lemon zest, vanilla extract, brandy and yeast mixture. Make a bit hard dough, add some warm milk if needed. Leave it covered in a warm place to double in volume. Divide dough in 2 pieces. Make two round bread loaves. Place them on greased baking paper and leave in warm place to double in volume. Make three deep cuts in each piece. Brush them with slightly beaten egg and pieces of sugar. Bake in preheated oven on 200 degrees C (390 F) for 45 minutes. Makes 2 round bread loaves.